The Spectra Nova: Empty Spaces? 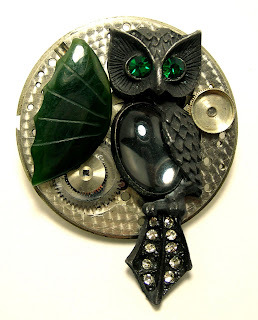 Did you ever notice the empty spaces that you might see in my Steampunk Pendants? They look like shinny silver or brass gears, but in actuality they are Mainspring Safety Drums, minus the cover & spring. The mainspring is what creates the tension in order for the clock to work and the gears to move. Placed deep inside a hand wound watch, it usually has a safety cover and then another pinon on top, the spring hidden insde. I soon found out that just because those springs don't have a fair amount tension on them, doesn't mean they won't come flying out at you in a hurry and attempt to blind you at the same time. Well I have a plan for these empty spaces. In the coming months you will see gorgeous cabochons of garnet and perhaps jade set inside these drums. Keep your eyes peeled for the very first sneak peaks of these on my blog!